The propeller that you see on the cabin wall to the upper right is not only an item of decor and conversation, it is our actual back up propeller. It’s compact living to be sure, but we love the simple lifestyle and freedom. You can see more pictures of Windsong II, our sailboat, here. It’s a Hunter 356, which is just short of 36 feet long. Scene from Charles’ last trip to the Bahamas. 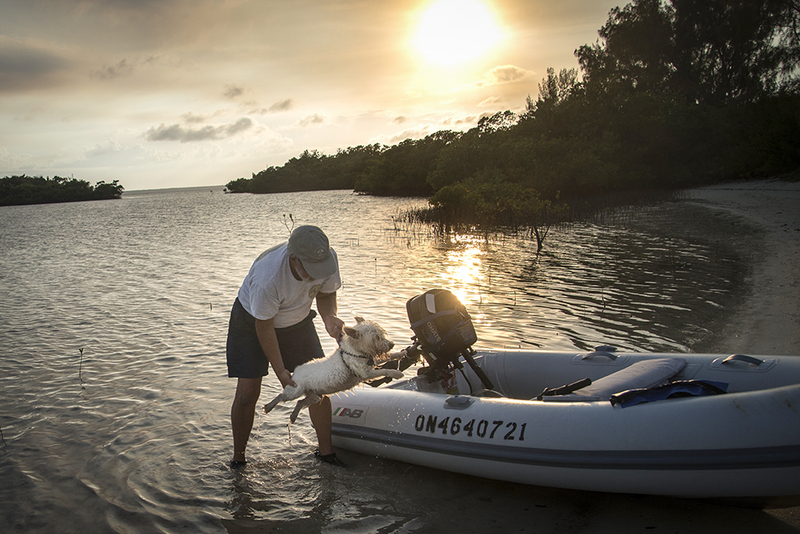 The last few years we’ve stayed in marinas as we cruised with one or two salty dogs, our Westies, Angus and Charles — and being on the dock made it much easier to get them off and on the boat many times a day — but sadly, it’s just Bob and me now. So we have the option of anchoring out or taking mooring balls, which require dinghying to shore. Right now we are in southeast Florida in a mooring field. We’ve stayed here before and really enjoyed it. It draws a community of friendly cruisers from all over the United States and Canada, even other countries. As part of the modest fee, you have access to showers, tuck shop, lending library, lounge, laundry facilities, wifi, bikes to rent, a shuttle bus and special events. There are also lots of great restaurants in walking distance. And shopping if you have the need. Leaving the mooring field behind as we dinghy to shore — this particular day it was early morning. On board, we have a 70 gallon fresh water tank, which we use for washing dishes and such, and to fill it we need to haul 5 gallon jugs to the boat. Once you’ve hauled a few of these heavy suckers, you find ways to minimize your water use! Last year we installed a solar panel, so this year we have been relying almost 100% on solar for our electricity — fridge, freezer, LED lights, computers etc. On rainy days, we run our diesel generator briefly to provide power. Many other cruisers have wind generators too, but we haven’t gone there at this point. All in all, we have a much lighter ecological footprint than we do on land. It’s called Sunset Bay for a reason. One shore faces east and the other west, so we are treated to beautiful sunrises and sunsets almost every day. I don’t have to go far…just a few steps with my camera and there it is. I never tire of this beauty. I so want to have a boat like yours , but in my place permit so complicated and costly . Nice place , i agree for that . Like freedom . Hello! I just came across your blog. Great photos! We live aboard too, we sail in Greece. Our yacht Fandancer is currently out of the water for the winter and we are back in the UK to visit friends, family and my young grandchildren. When we return to Greece I will write more about our travels, although there is some info on my blog. An old school friend of mine lives in Nassau, I stayed with her once, such a wonderful place for sailing! Enjoy your travels. I envy the life you are living, my friend…and your phenomenal photography skills. Gorgeous images, as always! Your happy place is beautiful, Sherry. Please keep us posted here. What a unique life. I can imagine how nice it is to be out there, away from the hustle and bustle. 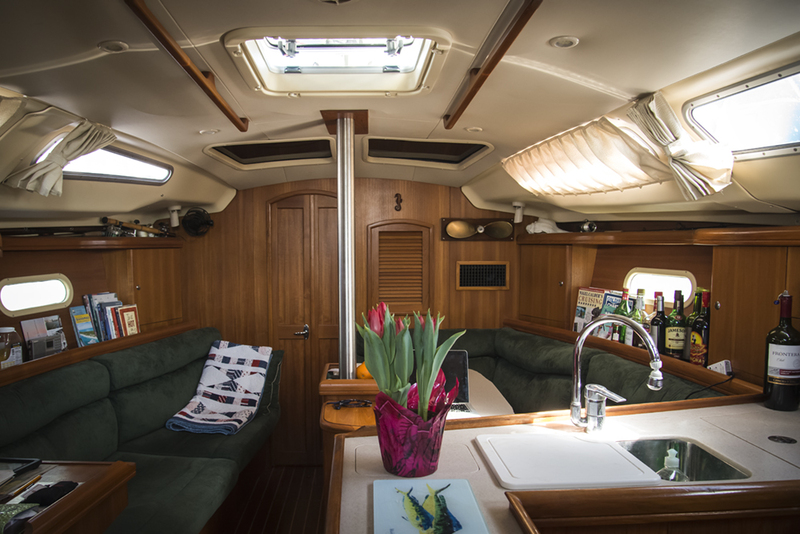 It seems as if you have your time spent on your lovely boat organized to the last detail! All that and sunsets and sunrises over the water too! It sounds as if you and Bob are living the life that you most enjoy! 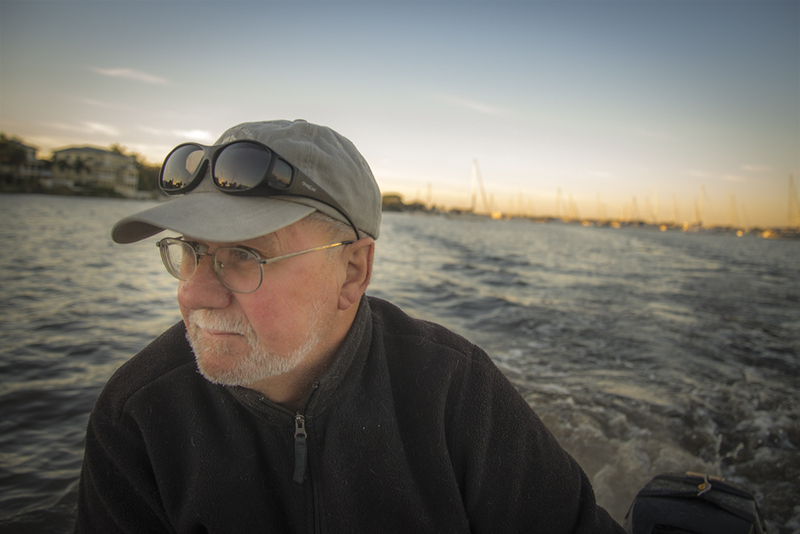 I loved reading about your boat and your routines- and Bob’s words about connecting to mother nature. What a wonderful life you lead, Sherry- and I’m looking forward to seeing more photos of this special part of your life. How absolutely wonderful to spend time on that beautiful boat in that beautiful area. My brother and his wife sailed for 6 months a few years back. They went from the gulf coast in Texas to Aruba. Many wonderful memories they had from that trip as I am sure you do as well. I love coming here and listening to your sea stories. I try to imagine what it must be like and then I think, you and Bob are so brave. Doing what you love sometimes takes a lot of courage. So now I judge how long winter will last by your sailing adventures. Can’t wait for part 11. Enjoy. Looks & sounds like a beautiful way to spend the winter. Glorious images Sherry. Sherry, I’m envious of your time on the boat. Though, not so envious of having to haul water in that way! I agree with the gentleman above who said the interior of Windsong is warm and cozy looking. Gentle winds to you. Always a treat to see these, have fun as I am sure you will. I love hearing about your adventures on the Windsong! (I do miss the ‘boys’, though.) Smooth sailing – and keep these delightful stories coming.